If you want to own a luxury SUV that leads its sector in style, displays impeccable build quality inside and out, incorporates true 4x4 capability, and embodies proven pedigree going back decades, look no further than the brand’s Range Rover. The Range Rover has been the luxury SUV benchmark since Land Rover created the category in 1970, and over the years has been the premium utility of choice by royalty, dignitaries, the acting elite, music stars, sports heroes and socialites, a shortlist including H.M. the Queen of England, Prince William of Wales, Angelina Jolie, David Beckham, Kim Kardashian, Chris Brown, Beyonce Knowles, Greg Norman, Jennifer Lopez, Michael Jordan, Kate Moss, and the list of household names continues near infinitum. It’s simply the best of the best. 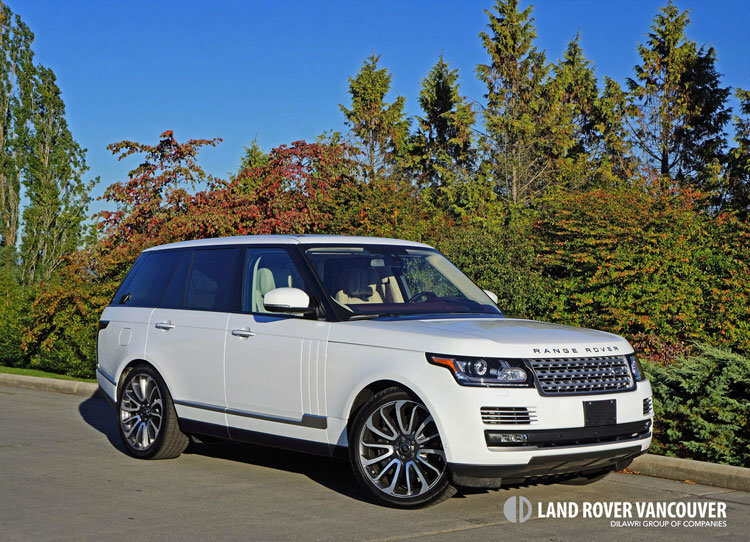 Most would agree the current Range Rover is an attractive design that simultaneously delivers strong presence and refined details, and while its aluminum bodywork is stunning, in the Autobiography’s case it’s what’s inside the counts. The Solihull, UK-based team that put together this top-line model didn’t allow a single square inch to appear common. Even the strap to pull up the cargo floor and access the spare tire is contrast-stitched leather. There isn’t a single SUV on the planet that’s more perfectly finished inside than this Range Rover Autobiography. Where the Range Rover reigns supreme is in the details, especially the switchgear, its numerous buttons, dials, toggles and rockers far and away the best in the biz, their near perfect alignment, dense composite and aluminized construction, and ideal damping superb. The four-zone auto climate control interface with its digital readout filled metal rimmed and rubber edged rotating knobs are especially nice, albeit still paling in comparison to the various billet aluminum-framed driving controls that line the lower console, the circular gear selector dial that powers up from its flush recess at startup being the jewel in the electromechanical crown, while additional brushed, satin-finish, polished and knurled metals easily match any newcomer’s attempts, the perforated aluminum door grilles hiding components for the Autobiography’s exclusive 29-speaker, 1,700-watt, 3D surround sound enhanced Meridian Signature Reference Audio system that to an audiophile is worth the price of admission alone. Of course there’s no shortage of beautiful woods and sumptuous semi-aniline leathers either. The Range Rover Autobiography’s stitched leather dash, leather centre stack and lower console sides, plus its full leather door panels, not to mention the exquisite detail of the stitched solid/perforated leather and Alston suede-cloth pillars and roofliner is second to none, and a mirror match to the leather used for the superbly comfortable, massage and memory enhanced 18-way power-adjustable front seats, and powered rear seats with recline and lumbar, all four outboard positions replete with heatable and cooled cushions along with comfortable winged airline-style headrests. Even the thick rubber and metal-edge floor mats are special, as is the deep pile carpeting underneath, the latter extending to the very rear of the SUV where two adjustable tracks make tying down cargo via metal clasps less of a chore. Land Rover has come a long way with its infotainment systems in recent years, the current version easily up to par with most in the industry, although 2017 Range Rovers will feature a new larger 10.2-inch touchscreen as well as the brand’s impressive InControl Touch Pro interface that boasts quicker quad-core processing, a higher resolution display with great depth of colour, smartphone-style pinch and swipe technology, Apple CarPlay and Android Auto integration for better smartphone integration, downloadable apps to your car as well as an app for your phone that lets you perform functions remotely, and much more. On this note the Range Rover’s fully configurable primary gauge package is already state-of-the-art TFT tech that includes a full complement of features integrated within the multi-information display between the classic analog-style dials. Framing the gauges, the Autobiography’s heated leather, metal, and in my tester’s case, wood adorned sport steering wheel appears as much about form as function, and while filled with ideally fitted, well damped buttons that are large enough to use with winter gloves, its connectivity to the big 4x4’s electronically assisted rack and pinion steering system, and the ability to initiate gear changes through a set of large noble-plated paddles was even more compelling. The Range Rover’s quick-shifting eight-speed automatic joins up with a particularly potent supercharged V8 in Autobiography trim, good for 510 horsepower and 461 lb-ft of torque that results in a 5.4-second sprint to 100km/h, while fuel economy is still reasonable at 17.2 L/100km city, 12.5 highway and 15.1 combined. You’ll want to disengage Dynamic sport mode and access its more economical settings to achieve these numbers, which will initiate auto start/stop when the engine would otherwise be idling, along with other fuel saving technologies. I found this to be a more pleasurable way to cruise through city streets anyway. On that note, while fully aware Range Rover is legendary for its off-road prowess, the brand’s latest Terrain Response 2, with its ability to automatically adjust to road and trail conditions, and All Terrain Progress Control, which takes over throttle and braking in slow speed off-road situations, joining permanent four-wheel drive with true low gearing plus standard locking centre and rear differentials as well as loads of other 4x4 essentials for what many agree is off-pavement dominance, such attributes also help it overcome rough, poorly paved inner city streets and side lanes. The Autobiography comes standard with a fully independent air suspension that’s absolutely sublime in such situations, while it slices through fast-paced two-lane corners just as adeptly, all the while keeping driver thrilled and passengers comfortable. Parking the Autobiography is easy too, thanks to excellent outward visibility and a standard surround camera with superb clarity, the sophisticated feature also including Junction View, Trailer Reverse Park Guidance and Trailer Hitch Guidance, while 360-degree Park Distance Control sensors add even greater confidence when sidling up to stationary objects. If you’d rather relinquish control of the steering wheel altogether, the Autobiography also includes Perpendicular and Parallel Park Assist with Park Exit. All you need to do is brake. Now that we’re talking standard Autobiography features, a model that adds $35,500 to either regular- or long-wheelbase supercharged V8 models, additional kit not yet mentioned includes blindspot monitoring with reverse traffic detection, closing vehicle sensing, lane change monitoring, adaptive cruise control with Queue Assist and Intelligent Emergency Braking, adaptive HID headlights with auto high beams (LEDs will be standard for 2017), plus a lot of luxury and convenience items including self-synching doors, illuminated aluminum tread plates, configurable interior mood lighting, a centre-console cooler, a power sliding panoramic glass roof, dual-screen rear entertainment with a comprehensive remote and two WhiteFire wireless headphones, a tow package, and more. Of course, it pulls up most everything from lesser trims as well, the Range Rover Autobiography leaving nothing off my personal list of hedonistic wants. It even gets 40/20/40-split power-folding rear seats for expanding the already accommodating 909-litre cargo area to a full 2,030 litres. As noted earlier, Range Rover has been at the luxury SUV game decades longer than any competitor, so they’ve had some time to get it right. And the latest Autobiography is very right. In fact, its $151,990 base price even seems like a bargain when stacked up against a number of competitors. My Range Rover Autobiography tester came with options too, its $2,100 22-inch seven-spoke diamond-turned alloys upsized by an inch over the standard rims (a great deal considering they sell for $2,100 USD south of the border), its $1,500 head-up display making it easier to keep an eye on key parameters, and the $500 wood portions of the steering wheel making it seem a bit richer. My tester was finished in Shadow Walnut trim throughout, one of three no-cost veneers, while the rest of the interior was a mixture of Ivory and reddish brown Brogue, one of 17 cabin motifs. There are three headliner choices too, while my Range Rover Autobiography’s Fuji White paint was just one of 16 exterior hues. Suffice to say it’s highly unlikely you’ll ever pull up next to an identical Autobiography. I should probably mention here that the base Range Rover starts at just $108,490 with its new fuel-efficient TDV6 diesel, and while not as over-the-top luxurious as the Autobiography, its HSE trim is still plenty agreeable. All Range Rover trims, including the 200-mm longer seven-passenger LWB (long-wheelbase) version, deliver excellent value when factoring in this flagship model’s unparalleled quality and capability, while all Range Rovers enjoy some of the best resale values in the industry. When factoring in history and SUV heritage there remains no luxury SUV substitute for a full-size Range Rover, with the Autobiography amongst the best for luxury. It therefore remains the industry benchmark for all others to try and beat.